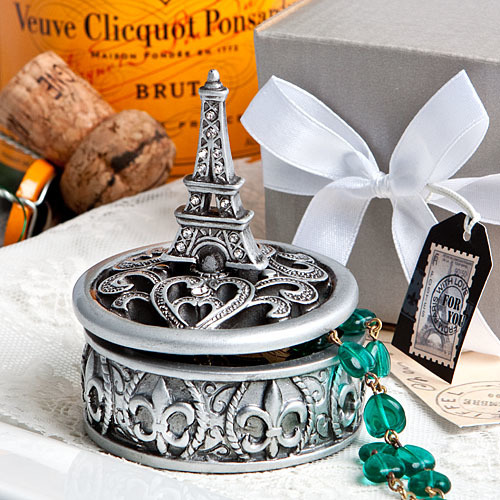 These beautiful Eiffel Tower trinket boxes were design with a French inspired bridal shower in mind, but are also perfect for those celebrating with a Paris baby shower theme. After all, what woman wouldn't love these to use this stunning curio box? Each favor measures 2 ” round x 3” tall. Two piece round curio box made of durable poly resin in elegant antique silver. The top features a dramatic cutout design with intricate swirls and rhinestone accents, topped with a rhinestone-enhanced Eiffel Tower standing tall at the center. The silver base is solid with a carved fleur de lis design with braided accents. Beautifully packaged in a silver box, wrapped and tied with a white satin ribbon and finished with an attached vintage postage stamp design “For You” tag.